Exterior of Deerhurst care home in Bristol. We are delighted to be working with Brunelcare, renowned South West regional care provider for older people, and today we had the pleasure of our first visit to Deerhurst in Bristol to meet with the manager and have a tour of the home. As the photos below illustrate, this is a vibrant place to live, offering lots of stimulation for those living with advanced dementia, and a busy programme of activities including gardening, swimming, singing, music – and even the occasional ‘Deerhurst’s got talent’ contest! Trips to the coast are a regular feature of life at Deerhurst, but meanwhile, there is also a beach in the courtyard for residents, family and visitors to enjoy. The corridors at Deerhurst are decorated with lovely outdoor scenes. It makes such a difference to be collaborating with such enthusiastic partners and we look forward to working towards a satisfying outcome for all. Following on from our pop-up exhibition of audio stories, produced from our winter visit to the MShed (see Memories and Museums) we have been developing another auditory experience using chairs, and inspiration drawn from venturing outdoors. Here I introduce the concept of a therapeutic rocking chair for older people with dementia. Early on in the Tangible Memories project, we recognised that access to the outdoors, and specifically to the natural world, was very limited for many care home residents, often due to a decline in their physical mobility, or particularly if they were suffering from the more advanced stages of dementia. Equally, when we asked ourselves as a team, ‘what would we want in a care home of the future?’, we identified the simple routine of being able to go outside and experience the elements as something that would be of great importance to us all. So throughout the project, we have been seeking different ways to incorporate aspects of life outside the care home environment into our technologies and prototypes, for those who are not able to venture out independently, or as often as they might like. 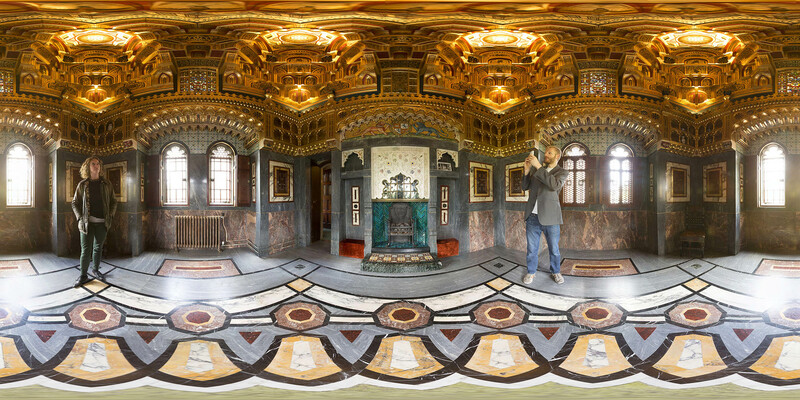 Example of one of the 360˚ photographs for use in the Oculus Rift headset. The technology provides an opportunity for virtual visits to museums and other local places. In this short film, as we focused on the many calming and uplifting effects of nature, such as birdsong or the sound of a river, we felt that adopting such a therapeutic approach would be particularly beneficial to residents living in the specialist dementia care home. Anxiety, agitation and memory loss are recurring symptoms of advanced dementia, so rather than placing the onus on an individual to remember past realities, we wondered whether it would prove more positive to provide an evocative soundscape of the natural world, without visual stimuli, where a person’s imagination could wander freely, and enjoy fact or fiction, in a peaceful listening experience. How can interfaces support slow and meditative interaction in a fast paced world? How would it feel to be able to ‘tune in’ and interact directly with digital ‘bits’ of data? Thinking about the meditative field recordings that I had already captured from nature, and wanting to combine these with Pete’s app to create a calming user experience and interaction, the traditional rocking chair seemed like an appropriate medium for a therapeutic listening experience, simply by embedding some speakers in the headrests. Rocking chairs can be a familiar item of furniture for many older people, the type of chair which provides an opportunity to dwell, ponder and relax, with its motion considered to be very comforting. (Perhaps why babies and young children are typically rocked to sleep). 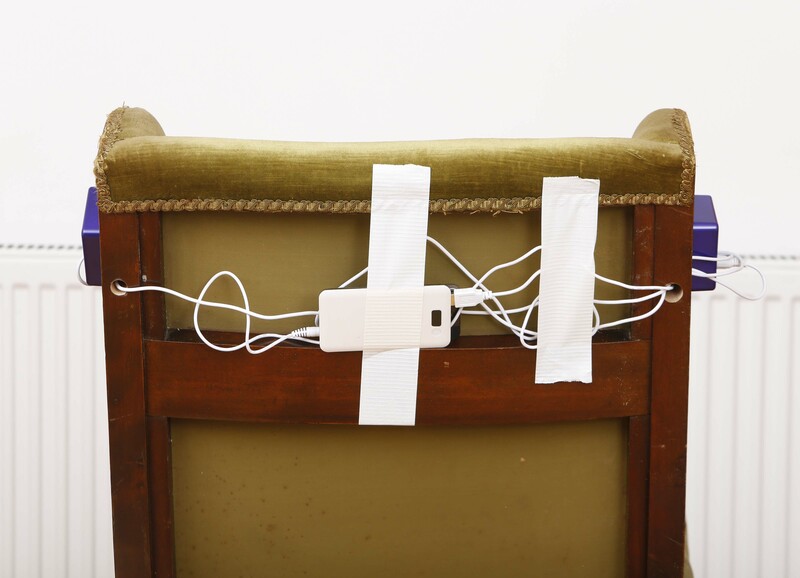 The rocking chair would offer this spontaneous and relaxing listening experience through hidden stereo speakers in the headrests, connected to the Harmonic User Interface app on an iPhone. 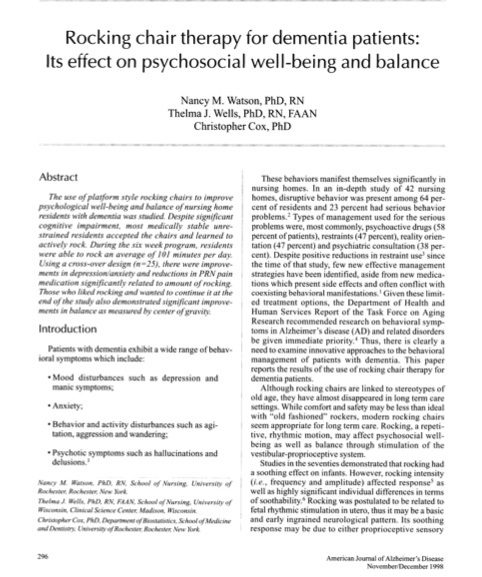 The US study used traditional platform rocking chairs and their rocking motion alone as a form of therapy, which researchers found could improve balance, muscle tone, emotional well-being, and resulted in a reduction in the number of requests for medication to treat aches and pains in the majority of older people they tested. If such results could be achieved with support and persistence, using a traditional piece of furniture, what more might we be able to offer residents by embedding therapeutic sounds triggered by the rocking motion? One of our key aims on the Tangible Memories project is to develop assistive technologies that enhance the social, personal and emotional well-being of older people, in addition to addressing their physical needs. 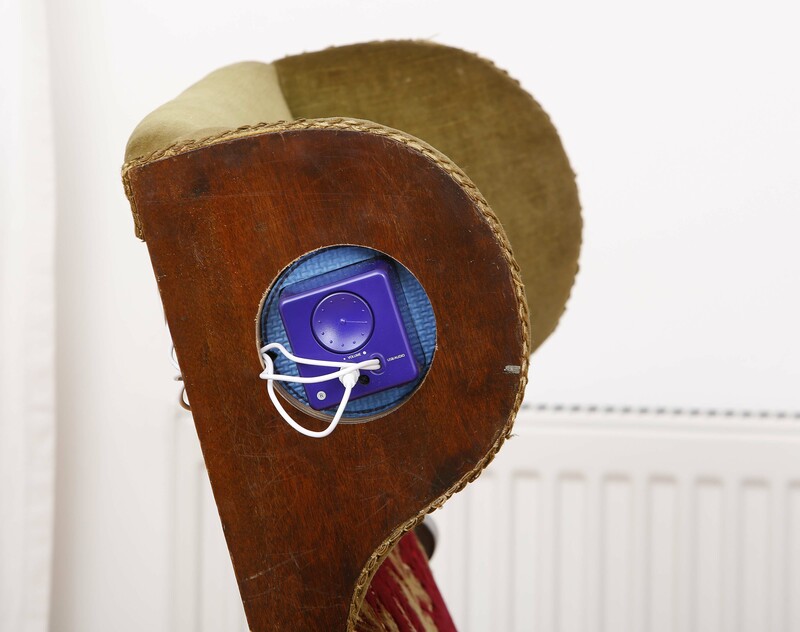 Speakers fitted into the headrests of the rocking chair, visible from the back only. In future prototypes, these speakers would be completely hidden. The next step required uploading an adapted version of Pete’s Harmonic User Interface app (currently called ‘SoundChair’) to my iPhone and then adding the sound content via iTunes. The app can play any m4a, mp3 or aac file which is triggered by the rocking movement. 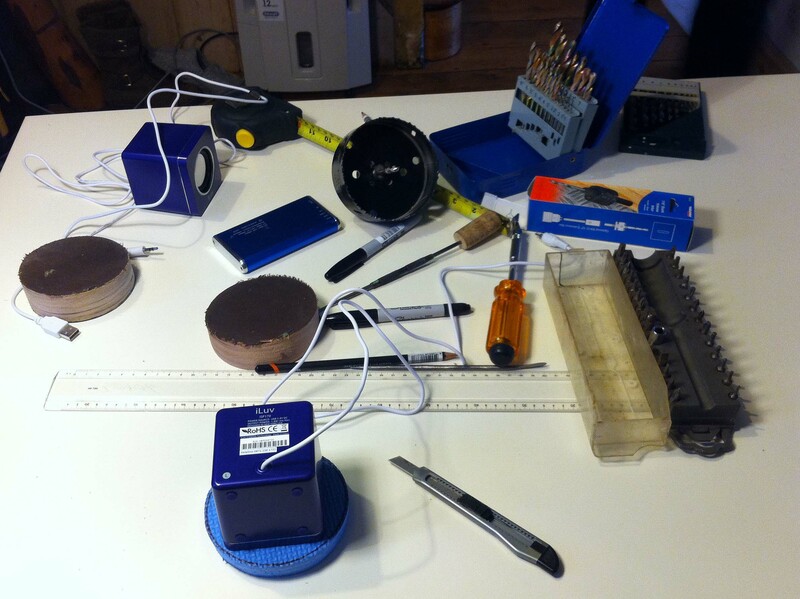 Next, the speakers were crudely connected to a battery power pack and my iPhone…. …..and we’re ready to test it out!